In the heartland of Old Castile, in a remote rural region in central Spain, is the world’s largest collection of historic organs. 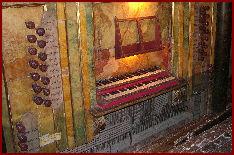 Discovered in the 1970’s by the French organist Francis Chapelet, when not one of the ninety historic instruments to be found there was playable, some thirty are now alive again, largely unaltered since the eighteenth century. THREE CDS, AVAILABLE ONLY FROM THIS WEBSITE, FEATURE TWELVE OF THE BEST OF THESE ORGANS. Francis Chapelet’s unrivalled understanding of these remarkable survivors is revealed in a sequence of varied improvisations on each instrument, each followed by one or two written works from the Spanish repertoire. The organs featured on these recordings date from the late seventeenth to the early nineteenth centuries, together with one instrument built in 2007 using the case and soundboard of its eighteenth-century predecessor. They are to be found in the villages of Abarca de Campos, Ampudia, Autillo de Campos, Boadilla de Rioseco, Capillas, Carrión de los Condes, Castromocho de Campos, Frechilla, Fuentes de Nava and Paredes de Nava. 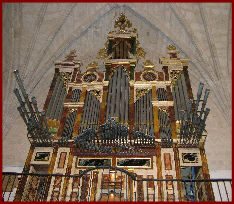 Most of them were either built or rebuilt by Tadeo Ortega, the last of the great eighteenth-century organ-builders of Spain. EACH CD HAS RECORDINGS OF FOUR ORGANS AND THE BOOKLETS CONTAIN THE HISTORY OF EACH INSTRUMENT AND FULL SPECIFICATIONS, AN INTRODUCTION TO THE ORGANS, A BIOGRAPHY OF THE ORGAN-BUILDER TADEO ORTEGA, AND A SHORT ARTICLE BY FRANCIS CHAPELET.